Cholesterol has been the main reason for people to suffer from many deadly diseases including the heart problems and other ailments. Cholesterol is formed in the human body due to excess intake of fat content and oil contents in the food. But many prefer to go with artificial medicines for reducing the cholesterol level rather than trying with some natural remedies for which are more effective and do not have any side effects. In this article, we will have a discussion on the unique herbs which reduces the cholesterol levels in the body. Even though many help in this factor, we have considered only the best herbs. The seeds of this plant herbs prevents the entry of cholesterol into the human body and also eradicates the possibility of occurrence of heart blockages in the arteries. The fibers and the other acids in this plant helps in suppressing the cholesterol from getting combined with the blood platelets in the body. Mostly HDL cholesterol do not make any harm to the functioning of organs in the immune system. Even though they can be consumed in prescribed quantities by heating it, too much consumption of alfalfa seeds can cause some ill effects to the red blood cells in the body. Capsicum is an ingredient used as a substitute to chilies in many dishes. They are capable of producing enormous inducing capabilities to improve the circulation of blood in the body. When there is good circulation of blood flow in the body , there won’t be any chance of cholesterol getting mixed with the blood platelets and also helps to provide the transportation of required gases into the body. There is also proven results of capsicum having the tendency to reduce high blood pressure levels and cholesterol contents from the body. Garlic is one among the essential herbs for curing health problems from the ancestral days. The main properties of sulphur contents in the garlic helps in keeping the cholesterol level in the body under control. It is also to be noted that it has thrice the amount of sulphur when compared to other vegetables making it a unique herb to control the serum and the cholesterol levels in humans and also increases the HDL content in the body. They prevent the formation of plaques which are the main causes of heart related ailments. 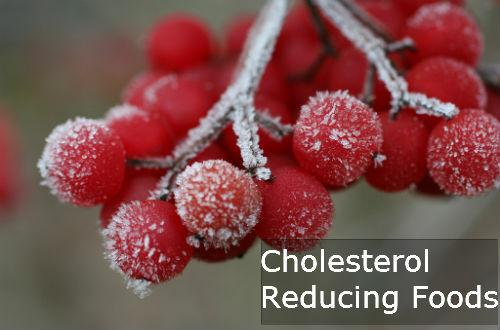 They have been widely used all over the world to reduce the cholesterol levels. Recent studies revealed the fact that minimal quantities of psyllium is said to have an effect of reducing 4% of cholesterol contents from the body when consumed on a daily basis twice a day. They also found to control the serum levels in the body. Hence it is recommended by experts to consume this herb on a daily basis of nearly 4 to 8 grams along with low cholesterol diets. They can also be used as a combination with oats to produce the same result. The red yeast rice is commonly used in the Chinese origin for food purposes as well as medicinal benefits. They are good agents of promoting blood circulation in an enhanced manner and also helps in the improved functioning of the digestive system. They also help in increasing the HDL cholesterol level which is termed to be helpful for the humans and reducing the LDL cholesterols. The consumption of red yeast rice has shown considerable reduction in the formation of triglycerides which are the main causes for the formation of blockage substances in the body. Now a day’s these have come in the form of capsules which are recommended by the physicians to consume for a month to get better results. These Fenugreek seeds are mainly responsible for reducing the cholesterol levels in the body. They also help in increasing the metabolic activity of the body, which in turn burns out the unwanted calories especially the fat contents in the form of sweat. These fats are the major contributors of cholesterol in the immune system. They are rich in alkaloids and proteins which help in the absorption of substances which induces the cholesterol levels in the human body. The normal recommendation of intake of Fenugreek seeds by experts is nearly 4-25 grams per day. The guggul is one herb which contains more quantities of useful volatile oils and gum like substances in addition to the resins. They extract some sterones which acts against the triglycerides and the cholesterol contents in the body. They are also considered to be rich sources of antioxidants which reduces the risk of attaining heart ailments. They can consumed up to 75 grams everyday and can show better results in two to three months. People with infections in the liver and bowel are advised to consult the physician and get approval before consuming the supplement. The roots of the licorice plant helps in improving the overall health of a person. They are most abundantly found in the continents of Asia and Europe. They mainly help in maintaining the proper functioning of the heart and especially for women’s, they help in maintaining the perfect levels of hormone and also revitalizes the liver. Hence they are considered to be one of the most unique herbs which helps in reducing the cholesterol levels. The combinations of these berries are mainly used by cardiologists for treating ailments related to heart. They help in the proper functioning and improving the wellness of the heart. The arteries which carry the blood to heart are protected without getting damaged with the help of this supplement. In addition, they also help in controlling the blood sugar levels in the body and maintains the normal blood pressure in humans.